Today in Warsaw, three presidents of Poland, Lech Wałęsa, Bronisław Komorowski and Aleksander Kwaśniewski, met the president of New7Wonders, Bernard Weber, in a display of solidarity with the Polish Finalist in the New7Wonders of Nature, the Masurian Lake District. The occasion for the meeting was the handing over of the Official Certificate of Participation for the Masurian Lake District. The event took place in the Ballroom at the Palace on the Island in the Royal Łazienki Museum. 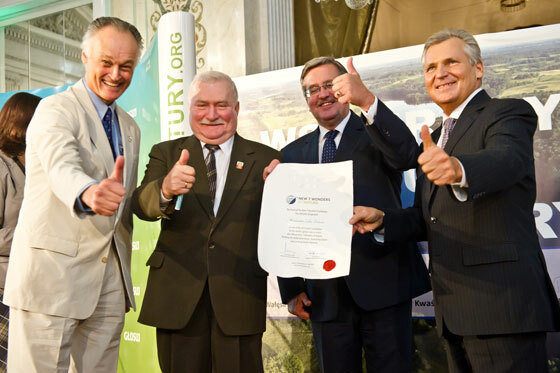 The meeting, which was hosted by the Lech Walesa Institute, was also attended by Jacek Palkiewicz, honorary ambassador of Mazury; Jacek Protas, Marshal of Warmia and Mazury; Peter Gulczynski, President of ILW; Rafal Szmytke, President of the Polish Tourist Organisation; Ireneusz Bil, director of the Foundation Amicus Europae, and Elzbieta Ofat, representing Director Tadeusz Zielniewicz of the Royal Lazienki Museum.